Construction of a new iron pier at Ventnor commenced in 1885 and it open in 1887. Steamer services ceased during WWI although the pier pavilion continued to provide entertainment. 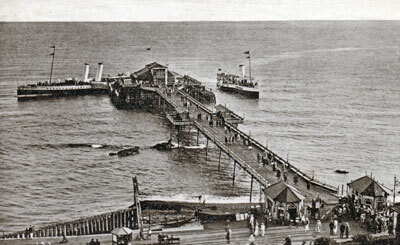 After the war, the pier was a popular 'port of call' for excursion steamers along the south coast. During WWII, a 100ft gap was put in the pier's decking (as happened to many piers to make them unusable in the event of an invasion); decking and iron work was cut away and allowed to fall into the sea. After WWII, a survey showed much work was required to re-instate the pier. With aid from central government, work commenced in 1950 to virtually rebuild the pier - when the work was finished, it was actually described as a new pier.